Since their launch in April 2018, the Durable Solutions Indicator Library and Analysis Guide have been put to use in various contexts and ways. For instance, we recently had a chat with Middle East Consulting Solutions (MECS) about how these tools informed their study on durable solutions for IDPs in Syria. In this article we’d like to share another example of how partners have drawn from the library in the field: at the occasion of the 2018 UNHCR consultations with NGOs, we met Cristosal – an organisation working to advance human rights and protect people displaced by violence in El Salvador, Guatemala and Honduras. As we learned during our conversation with their director, Noah Bullock, and Mauricio Quijano, their community development director, they made extensive use of the durable solutions indicators and analysis guide to inform community-level solutions analysis, as well as to raise awareness of internal displacement at local and global level. What is particularly interesting about Cristosal’s approach is that they are not only using the durable solutions indicators to better understand the situation of IDPs and their progress towards solutions: they also make use of them to assess the potential capacity of a specific municipality or community to host IDPs, and to address remaining gaps in guaranteeing their rights in said communities. 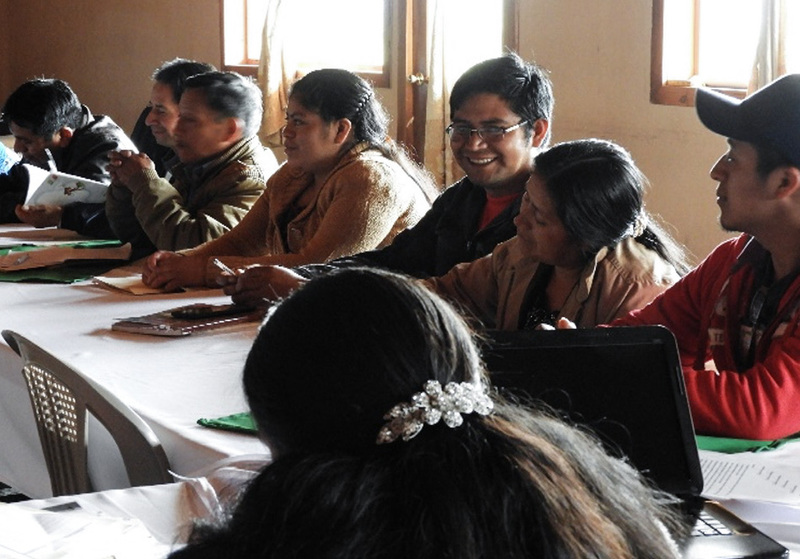 The resulting assessment, they hope, will not only feed into Cristosal’s advocacy and local planning efforts, but also serve as a basis for IDPs to make informed choices about their preferred solution. Linda (JIPS): Hi Noah and Mauricio. Can you tell us how you have been using the Durable Solutions Indicator Library in your efforts? Noah (Cristosal): We’re starting from zero here: this is a region where there is still no official recognition of internal displacement. So we’ve been trying to introduce the concept of durable solutions as being part of the process when working with internally displaced people. Mauricio and his team have led a series of workshops and trainings around this with civil society and municipal government representatives. Mauricio (Cristosal): As a first step we went through the [durable solutions] indicators to select the ones that were relevant to our setting. We came to a total of about 90 indicators. The next step was to understand how to adapt the selected indicators to our context of internal displacement due to widespread violence. As a third step we tried to translate these indicators into a handbook, with instruments and tools to allow for their application at the community level. Internal displacement in this region is invisible. There is little awareness in communities about the phenomenon and high levels of stigmatisation. We are currently also working to integrate these durable solutions indicators into our regional monitoring system [to address the lack of data about internal displacement in the region]. Noah: In fact, we’ve developed a system that includes a common documentation form and a database. We’ve also built a network of organisations – both state and non-state – to use this platform. This has already allowed us to generate comparable qualitative data on the displacement situation. The idea now is to use this same database to monitor the durable solutions variables. Community leaders and organisations can then conduct surveys based on the durable solutions indicators and gather the data directly to the joint database. This, we hope, will facilitate data collection as well as allow us to analyse the information across all variables. Linda: What were the challenges and perhaps also opportunities that you encountered when carrying out this project? Noah: Internal displacement in this region is invisible. There is little awareness in communities about the phenomenon and high levels of stigmatisation. Thus it was necessary to first just bring attention to internal displacement and introduce the concept of durable solutions with partner organisations. Mauricio: In terms of opportunities, working towards durable solutions strategies also means contributing to the sustainable development of communities. This is an important window for us when it comes to preventing discrimination in the host community. Linda: Do you have any recommendations for other organisations interested in using the durable solutions indicators for their own purposes? Mauricio: We found that the durable solutions indicators and resulting analysis can be an important tool for bottom-up advocacy, so from the local level to inform national level policy. Noah: Our idea is to use the durable solutions analysis to demonstrate how responses to internal displacement can be integrated, or should be integrated with local territorial development planning, or even cross-cutting issues such as security, rather than creating another institution for IDP matters. On a more practical note, our first idea was to hire a researcher to do the durable solutions analysis. But this would have limited our possibilities because we would have had to hire people every time we wanted to use the tool. Our idea is to use the durable solutions analysis to demonstrate how responses to internal displacement can be integrated, or should be integrated with local territorial development planning. So we decided to create a more user-friendly tool so that community leaders were able to apply it themselves. This way, we can replicate the analysis multiple times without needing to hire professional researchers or technical people. In addition, the tool can be directly integrated into the communities’ own assessment processes to inform their development planning and objectives. Methods to work with local stakeholders and to steer local development plans towards the improvement of the human rights situation. 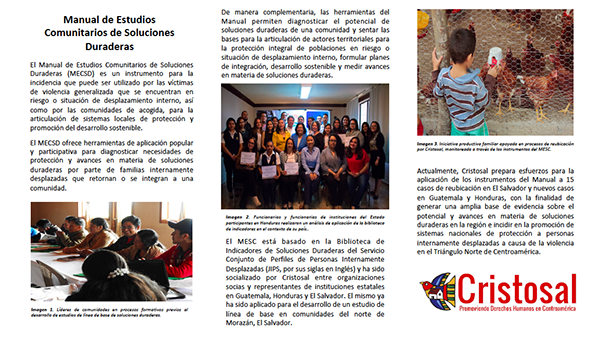 A summary of the Manual de Estudios Comunitarios de Soluciones Duraderas – or Manual for the Communal Studies of Durable Solutions – , Cristosal, 2018. Cristosal has piloted the approach with 10 families. They have also carried out several workshops, including a six day training with representatives of Honduras’ Commission for the Protection of Populations Displaced by Violence (known by its Spanish acronym CIPPDV), two days of which were focused on durable solutions. We are looking forward to hearing more from Cristosal about their approach to measuring durable solutions to displacement, and will make sure to share this with you. Have you also been using the library and guide in your own activities? We’d love to know about your experience and feedback. Get in touch at info@jips.org or find us on Facebook, Twitter, or LinkedIn.